With search over, will Browns give Pettine a real chance to succeed? Cleveland Browns head coach Mike Pettine answers questions during news-conference Thursday, Jan. 23, 2014, in Berea, Ohio. The Browns flew to Mobile, Ala., on Tuesday to interview Pettine for the second time at the Senior Bowl. The four-hour meeting came shortly after Gase, the first candidate the team contacted, called Browns owner Jimmy Haslam and withdrew from consideration. Though it may feel like it did, the search for Rob Chudzinski’s successor didn’t really last as long as Chudzinski’s tenure as head coach. The latest chapter in the saga of the Cleveland Browns is over, and again the team moves forward with a new guy in a new orange tie and new era on the horizon. The Browns have done these introductions before. This latest one Thursday was met more with relief than excitement. A week after the team first met with Mike Pettine and two days after flying to Mobile, Ala., to meet with him again but leaving without him, Chudzinski’s office was officially filled. 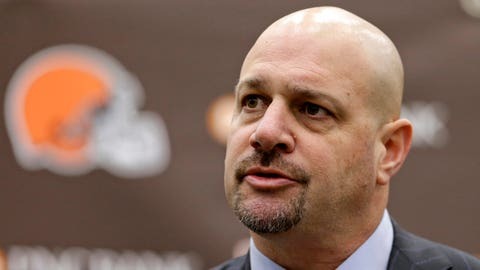 Pettine flew to Cleveland on Thursday, and by late Thursday afternoon he stood alone on a podium in the Browns indoor fieldhouse explaining why he was attracted to the job, why it didn’t matter that he wasn’t the Browns first choice because he’s fulfilling a lifelong dream, and why he thinks this latest attempt at giving the Browns a face and an identity will go differently than the others. That a lot of people won’t begin to believe it ’til they see it is not Pettine’s fault. Pettine said he understands climbing out of the AFC North basement will start with a willingness "to bloody your nose a little bit" and that in taking this job, "I’m betting on myself." Those are interesting answers. But a blue-collar mentality from a guy who 13 years ago was a high school coach and his desire to make the most of a chance he refused to let pass won’t make this try at being better actually any better unless he gets help from the guys who hired him. Sixteen months into the ownership of Jimmy Haslam, the stewardship of Joe Banner and the assumed contributions of hidden general manager Mike Lombardi, the Browns are on their second coach and entering their second full offseason, the one towards which many of their moves, decisions and assets have been pointed. It’s not now or never — this franchise has proven "never" is sort of an actual option — but it is time for Banner and Lombardi, specifically, to produce some results. If Chudzinski had to go, then Pettine has to win. After a reported 10 candidates were interviewed, he’d better be the right one. Opening Thursday’s press conference, Haslam strangely chose to make light of the fact that his new coach went 0-5 coaching high school games against his own father. Banner tried to deliver a Three Stooges joke, referencing an awkward moment during the press conference the team held the day after it fired Chudzinski, but Banner is a businessman — not a comedian — and didn’t exactly deliver it cleanly. Banner the football man had better deliver on May 8 and 9. And when free agency starts in March, too. Pettine was on the podium alone Thursday, but he’s not making it to 2016 — sadly, passing two years is progress by Browns standards — without help. Lots of it. The Browns need players. Bloodying opposing noses and stopping the internal bleeding and ending the cycle of losing and changing starts with building something that has a chance to last, and that starts with a quarterback and playmakers on both sides and draft classes that provide difference makers. "This franchise is in position, given the right leadership, to win," Pettine said. He said it right. He’s betting on himself. From the outside, he seems a longshot. The national perception of the Browns is not good. Of more pressing concern to the team’s decision makers is that local perception is not good, either. But as Haslam pointed out after Chudzinski was fired and again in a letter to season-ticket holders last week, the Browns have a bunch of draft picks starting with two first-rounders, a bunch of salary-cap money and a chance to show the progress Haslam and Banner felt they weren’t showing under Chudzinski and two $2 million coordinators last season. The NFL’s Next Man Up ideal goes for coaches, too. "There’s talent here and that’s evidenced by the number of Browns that are over in Hawaii (six, for this weekend’s Pro Bowl) as we speak," Pettine said. "Again, it will be a big job for our staff to evaluate that roster. The nice thing about it is there is some definite talent here, young talent here and we also have the ability to keep that talent here. That, to me, is one of the things that was most attractive about the job." He needs more. Last year’s offseason probably upgraded the roster but not the results. A quarterback of the future is atop both the need and want lists this time around, and trading Trent Richardson last September and two mid-round picks last April and keeping all that cap money in the bank last year will count only if the Browns spin all that forward and get players who can help — and soon. Pettine mentioned the thought of "the same old Browns," teams that talk themselves into losing and "changing that culture." That’s probably exactly what Haslam wanted to hear and what he heard in those interviews. He needs his administrators to deliver. During the interview process, Pettine’s college-aged daughter sent out a tweet that said her dad felt good about his initial meeting, was set for another interview and might realize his head-coaching dreams. "It’s the Browns," she wrote. "But hey, still pretty cool." That too many people who know the NFL knew exactly what she was trying to say is part of the Browns’ perception problem. Pettine had a very good answer prepared Thursday when that tweet was brought up, that not only had his daughter learned a lesson but that she was raised with the Ravens. The last five coaching changes made in the AFC North have all involved the Browns. Pettine is aware of that, hoping to change that, ready to dive in with the same vigor and passion his predecessors have. That his hiring is met by most fans with more relief than anything else isn’t his fault; if he only has two years, he has to try like crazy to make the most of them. The search led the Browns to Pettine, and when the team finally popped the question he couldn’t say no. It’s not a job some other guys wanted, but hey it’s still pretty cool. With the right pieces, decisions and leadership, he might even make something of it.